I love blazers, jackets, and any fitted and flattering upper body wrappings. Unless you are quite tall or wearing high heels, the shorter blazers will probably suit you better, but the longer cuts have a charm that works well with skinny jeans and stilettos. Personally, I am less in favor of the full skirt or pants suit and prefer the mix and match combinations of colors and styles. I find that a good choice of blazer is one that goes with jeans or a casual skirt but can, at the same time, look classy and business-like with the right formal pants. With spring around the corner, it’s time to take these staple capsules out and wear them with layers, if necessary, or simply on top of a T-shirt or blouse. 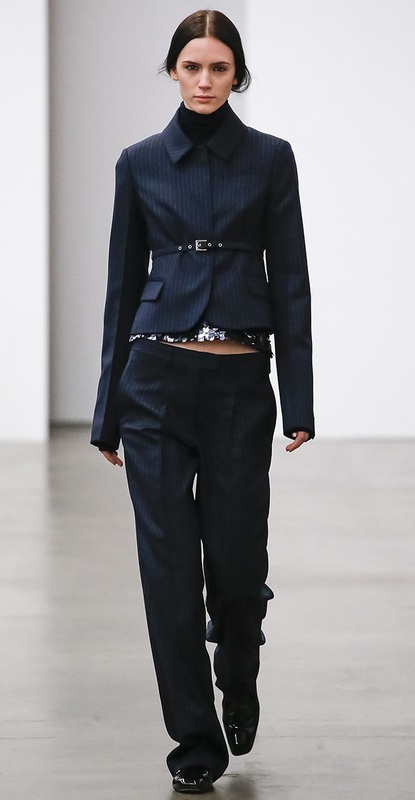 Some of the designs are great with a belt on top, as displayed in several recent fashion weeks. If you are going with the complete suited look, you may want to give it a twist by adding a touch of style, such as a longer shiny layer underneath, a belt, or a contrasting shirt color. Here are various ideas for a more casual, classy and on-duty look that may provide some inspiration. Enjoy. For additional images and ideas please visit my Pinterest boards here.